Handrails add additional security as measure to prevent falling. I chose this product for safety reason,the handles are perfect formy needs. I had both knees replaced, i love this has handles. 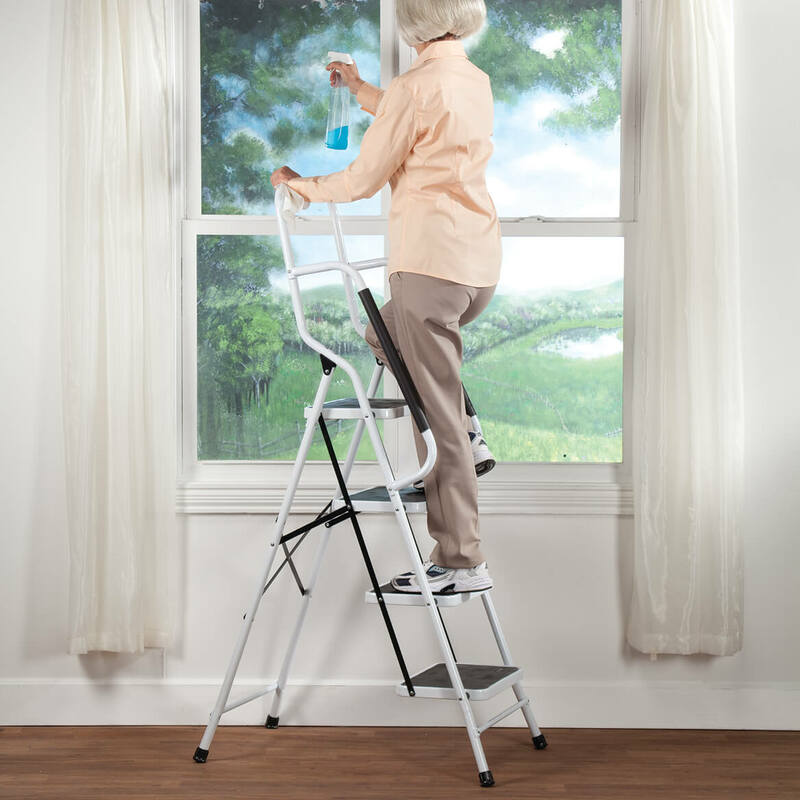 I needed a step ladder and I thought this one looked the safest for a senior citizen. 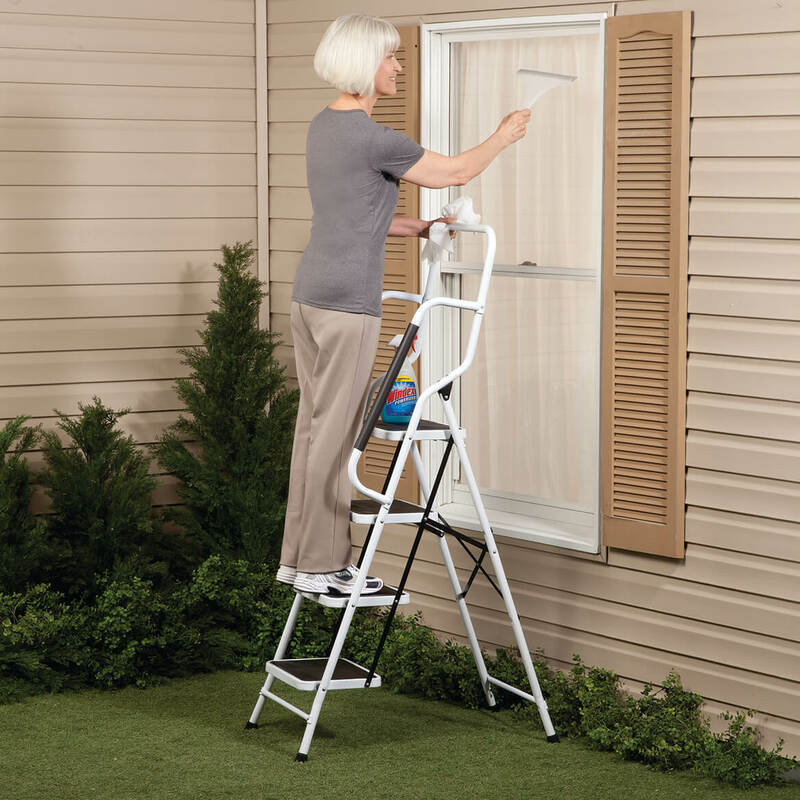 Being Elderly and mostly short I feel this will serve my and my Husband's needs..and the price w/savings was a +..
We already have a ladder much like this one, but without rails. As we are now considered members of the older generation we are hoping the rail we provide us we a touch of confidence as well as some additional safety for those trip "up"
works extremely well. I feel much safer on this ladder than others I've had. Chose this ladder because of safety handles going so high. Looked other places (Wal-Mart, Lowe's) but theirs didn't have safety handles like this one. 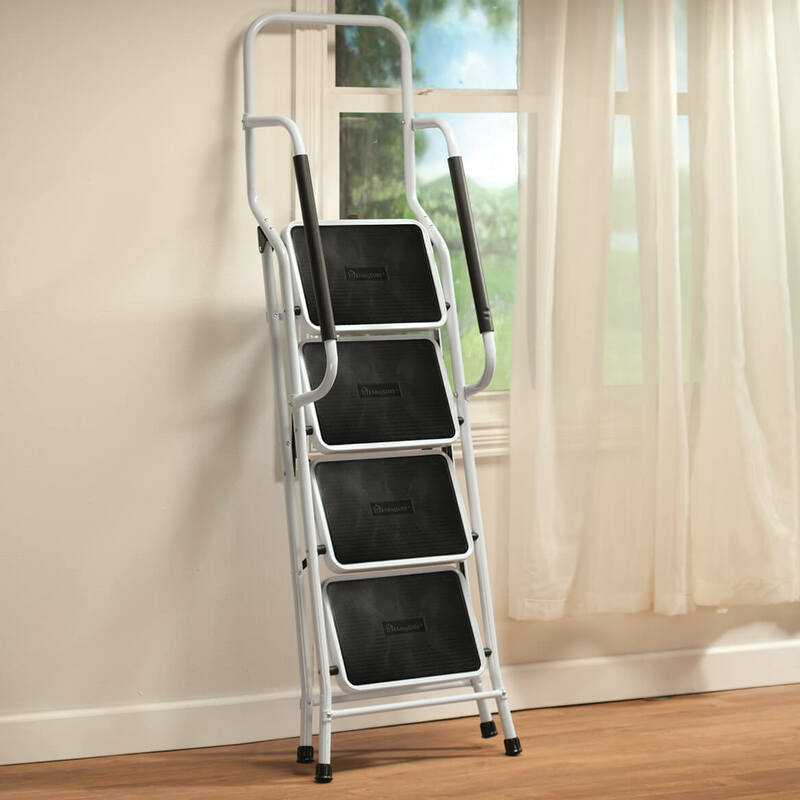 I was looking for a ladder that would give me something to hold on to while climbing it. This was the only ladder that fit my criteria. Thank you for selling it! Wanted to feel a little safer when climb to do things. I'm too short to reach top shelves in kitchen cabinets and handrails help keep me steady. I needed a larger latter. I likefty this one because of the safty handles at the top. I can’t climb ladders and I loved the four steps and rails too hang onton!!! My Aunt and I have one and they work great! I liked all the safety features. Wide steps, hand rails and high bar to hold on too. Bigger & safer then what we currently have at the clubhouse. I wanted a taller and sturdier step ladder. I needed a taller step-ladder than the one I have and the safety rails give me the added security that is important. Also, folds up and easy to store away. I have issues with heights and like the idea of the side bars. 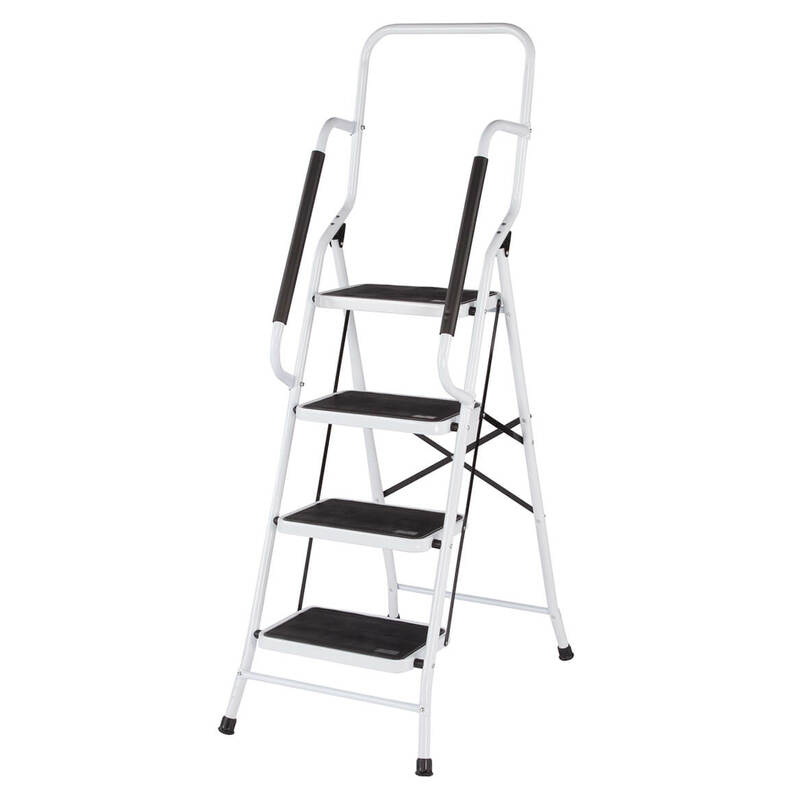 Needed 4 step folding ladder . Hand rails for safety. I have health issue and at times my leg feel weak. 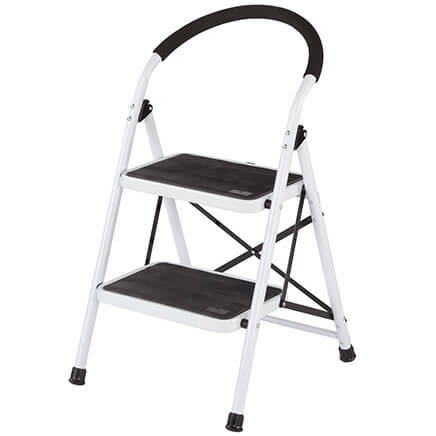 This step ladder has wider step with 4 step. The handle is st the right height to hold on to without falling. This is what I need for in and out of the house. The safety of the extended handrails and the ability to keep my balance while on it. Weight limit is higher than other choices, hand rails appear to be a good option. I am elderly and the rails helps steady me as I climb. So I can clean high places with the security of the handrail. It is the perfect size for me to reach my hanging plants for watering and reaching items in my kitchen shelf. Need ladder and looks sturdy. I am 76 years old and my kitchen cabinets are to high for me to reach and I needed a ladder with rails for safety to climb up to reach items without calling for help. I am short and also very independent. I also read the reviews and feel like this product will solve my problems. in product features it states it supports up to 30 lbs. I certainly weight more that 30 lbs. I don't understand this feature?????. BEST ANSWER: Thank you for your question. 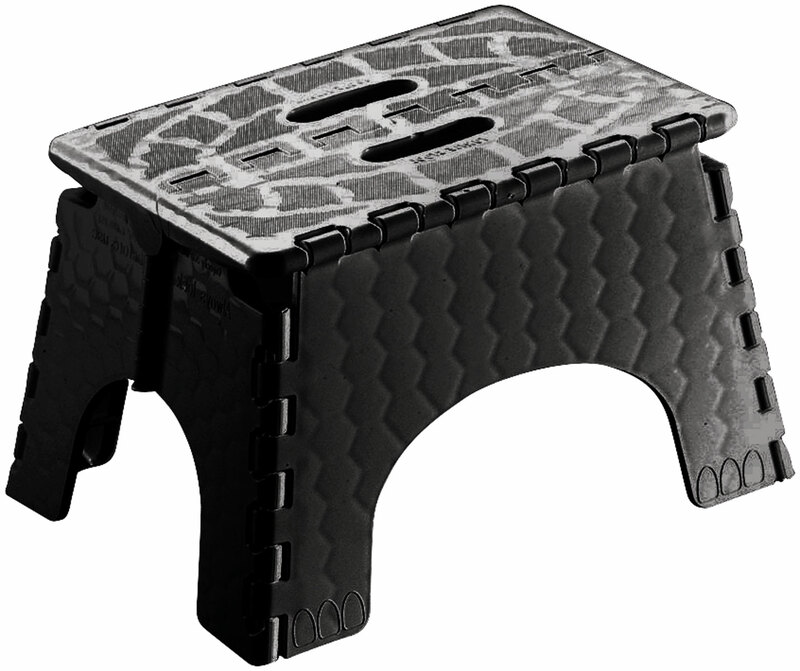 The step ladder can hold up to 300 lbs. We hope this information will be of help to you. BEST ANSWER: Thank you for your question. There is some assembly required for the handrails.We hope this information will be of help to you. The only thing that has to be done is to attach the side hand rails. The ladder comes fully assembled except for the hand rails. ITEM 354173 WHO MANUFACTURES 4-STEP LADDER W/HANDRAILS? BEST ANSWER: Thank you for your question. We ask that you please contact us so we may assist you further. We hope this information will be of help to you. The brand is "ideaworks" which is under the company " Jobar"
BEST ANSWER: Thank you for your question. This item weighs approximately 26 lbs.We hope this information will be of help to you. BEST ANSWER: Thank you for your question. It weights 26.85 pounds. We hope this information will be of help to you. BEST ANSWER: I have only seen it online-not in any 'regular' stores. It is a great ladder and the handles on the upper part are what make it so special. So glad I made the purchase. The delivery time was not long at all. It just seemed like we placed the order and it was being delivered. Thank you for your question. We do not sell our products in stores. We hope this information will be of help to you. Not aware of any store selling it. My wife especially finds it quite handy. Would recommend it highly. I bought mine from the Miles Kimball catalog. I love it. I bought it online from the Miles Kimball website. I got mine through a catalog. 1)Do the handles come off? 2) Does it fold up to less than 5” thick? BEST ANSWER: First, the handles on the two sides are bolted into place and could be removed (or not installed to start with). Second, the "thickness" of the ladder when folded is about 4" up to the height of about 32". Above that (even without the handles) it is about 5"--it is hard to measure accurately because it protrudes forward at one height (about 45") and protrudes backward at a higher level so you have to eyeball the combined thickness. Sorry, I haven't put it together because of an arthritis flare up in my hands. However, it is unpacked and looks very sturdy. You have to install the handles yourself with several screws each side. So unless you have super powers, they aren't coming off. As far as folded width, 5-6 inches seems about right. 1) I didn't put the side rails on the ladder. 2) Without the side rails, it's a little thicker than 5 inches. 1) You can leave them off during construction. No to both questions but is still a GREAT ladder! BEST ANSWER: For the most part it is. All you have to do is attach the side railings. I was able to do this, but a man was able to tighten the screws better than me. Thank you for your question. The only assembly required is for the handles. We hope this information will be of help to you. Partially. The basic ladder yes, you have to attach the side rails. How high is the 4th step from the floor? BEST ANSWER: The 1st step is about 9.5 inches from the floor. The 2nd is about 19 inches and the 3rd step is about 28.5 inches from the floor. The 4th step is about 38.5 inches from the floor. The ladder is very sturdy when on the top step. The top extension makes it easy to steady yourself on the top two steps. It's the best step ladder I've ever had. If I don't want to unbolt the handles, how deep is it in inches when folded closed? BEST ANSWER: Thank you for your question. It is about 9" with the handles on and folded. We hope this information will be of help to you. How many inches between steps? BEST ANSWER: Thank you for your question. The steps are 9 1/2" apart. We hope this information will be of help to you. What height ladder would this compare to - 6 ft.? I have tall ceilings in my house and need to clean ceiling fans. BEST ANSWER: Thank you for your question. It is 5 feet, 6 inches tall. We hope this information will be of help to you.